I have been thinking a lot lately about storytelling, especially in the wake of the election and the ensuing discussion of the role played by fake news sites, echo chambers, and filter bubbles. Stories can lead us astray. They can reinforce what we want to hear rather than tell us the truth. And many times, two different sets of people will listen to the same story and then leave with completely different takeaways. Another thing I think a lot about is data visualization—which, as we know it, is barely a century and a half old: it arguably started with William Playfair in the 1860s. But data visualization (and modern data science) are really just another phase in a tradition of human storytelling that goes all the way back to cave paintings. We have always used stories to help each other make better decisions. Look at the parables in religious texts or the folk tales we tell to children. We use data in the same way, to help drive better decision-making. The thing about stories is: they’re about people. They’re about explaining the things that happen to people, and they’re tools that we use to spread the history and shared values of groups of people (which is why they become so powerful in partisan election scenarios, for example). You may already be familiar with Anscombe’s Quartet. 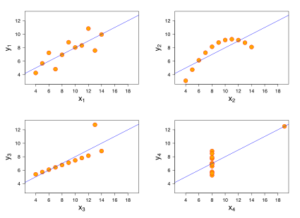 It’s four sets of data points (x-y pairs), and all four sets have the same statistical properties. So if you’re only thinking about them mathematically, they appear to be identical in nature. But as soon as you graph them, you see immediately that they’re very different, and you can detect with your eye a relationship in each dataset that you wouldn’t see if you were looking at them with math alone. Storytelling matters because it’s innate in us as human beings, and it’s how we learn about the world and think about the decisions we should make as people living in relationship to that world. Visual storytelling matters because it reveals relationships that we might not be able to understand any other way. An image from Aaron Koblin’s “Flight Patterns” project. There’s another thing that happens when you begin to make stories visible—to draw constellations—which is that meta patterns and structures emerge. 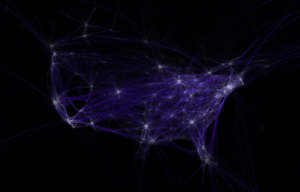 Take, for example, Aaron Koblin’s visualization of North American air traffic, “Flight Patterns.” Making those routes visible and layering them together in a composite reveals not only the locations of major cities, but also the shape of an entire continent, without the need for any geographic map as a base layer. The relationships between the data points end up describing more than just themselves, in part because of where the data isn’t: the emptiness describes the oceans. We all tend to think of data as infallible, as black-and-white, but once you understand that it’s not the data you’re presenting, it’s the relationships among the data, then you can see that you as the designer and storyteller are bringing something important to the process. You must be very deliberate about what of yourself you put into your visualizations. You are naturally going to have an opinion, and that will likely inform the story you tell. Stories are powerful things. And it’s not unusual for people to become so attached to a particular story that they insist on drawing their constellations in ways that ignore the position of the stars. Just think of the historical inaccuracies in almost every Hollywood war film ever made, especially Mel Gibson’s. 3D pie charts use foreshortening to create the illusion of three dimensions, but that same effect also distorts the data. Data, like stories, can also have the “ending changed,” so to speak. 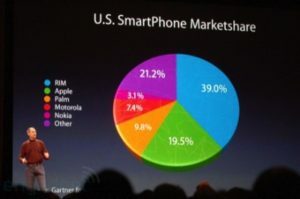 If I were to show you this image from a keynote that Steve Jobs gave at MacWorld in 2008 and ask you to tell me, without reading the numbers, which section is bigger, green or purple? You would surely answer “green.” But of course, once you do read the numbers, you can see that the visualization is misleading. From a storytelling perspective, this is the same thing as changing the outcome of a battle because you felt like it. You as the data scientist or as the data visualization designer, have an incredible impact on how the story gets told, and therefore on how decisions get made. Draw your constellations carefully, and use well the power to expose relationships and meta structures. Our ability to make good decisions—and even our futures—depend on it. 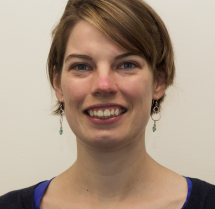 Editor’s note: Julie will be presenting her “From Data to Decisions” tutorial at TDWI Austin next week, which will elaborate on how designers can influence decision-making with data visualizations. Find more information, and sign up for her slides, here.